HomeBooks by AgeAges 4-8What’s in Your Library Bag? Early Readers. All of the following books were picked by my daughter. They are all level 2 early/easy readers and we both enjoyed every one. 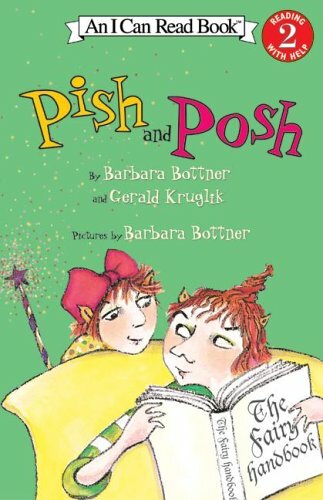 Publisher’s synopsis: Pish and Posh are very best friends. They live in the same house, share their chores, and usually get along. One day, a Fairy Handbook mysteriously lands at their door. An awfully curious Posh can’t resist the book’s magic, despite Pish’s warnings. When Posh learns that being a beginner fairy is tough work — and possibly big trouble — will Posh turn to her wise friend Pish for help? Young readers are sure to fall in love with this adorable and riotously original new pair of characters! TCBR award: A child approved gold star! Publisher’s Synopsis: Three stories about Rex and Lilly, brother and sister dinosaurs. First they play in the pool. Splash, splash, who can do the best trick? Next, Rex doesn’t want to go to dance class. But he has fun after all! Then Rex and Lilly have to play inside because it’s raining. Or do they? Easy words and bright pictures make reading with Rex and Lilly fun.